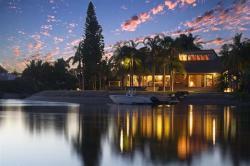 Temporary Resident buying with your Australian partner? This page is for those temporary residents that would like to purchase a home in Australia with their Australian permanent resident / citizen partner or spouse, spouse referring to either married or defacto. MAP is often contacted by these borrowers after they have been advised by their bank or mortgage broker that the maximum LVR available is 80% due to the lenders mortgage insurer requirements. 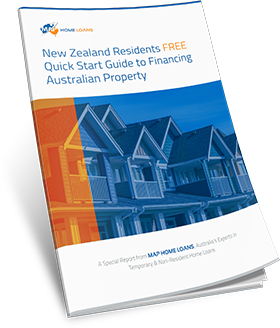 It is however possible for temporary residents to borrow up to 95% of the purchase price so only a 5% deposit is required providing one of the borrowers is an Australian permanent resident or citizen. The key to getting your home loan approved is applying to the right bank that will accept your visa and status as a temporary resident. This is where MAP can help. What Types of Visa will the Banks Accept? 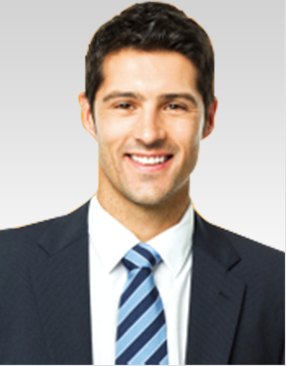 Generally the temporary resident partner would be on a Temporary Spouse Visa Subclass 309 or 820. However, the particular visa the temporary resident partner is on is largely irrelevant to some lenders providing the home loan and property is to be purchased in joint names. The non-resident partner / spouse could therefore be on a 3-4 year working visa such as a 457 or 485 visa or perhaps are on a Bridging Visa A or B. 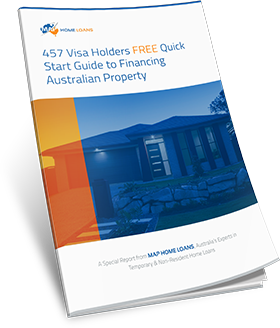 The key criteria to have your home loan approved whilst on a temporary visa is that the property is being purchased in joint names with an Australian citizen or permanent resident. If the partner or spouse is on a spouse or defacto spouse visa subclass 309/100 or 820/801 then the 5% deposit may not need to be genuine savings and may come from any source such as gift or FHOG. 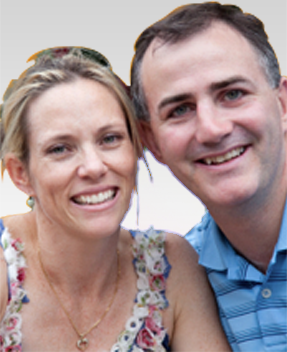 More information on no genuine savings home loans for spouse visa temporary residents here. There is more general information pertaining to Temporary Resident Home Loans HERE. 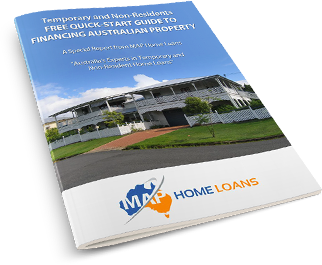 MAP specialise in Temporary Resident Spouse Home Loans and assist hundreds of Temporary Residents every year to arrange home loan finance. If you would like to know more about buying a home and arranging a home loan when you are purchasing with your Australian permanent resident or citizen partner or spouse CONTACT MAP for a no obgliation consultation to see if we can help you. 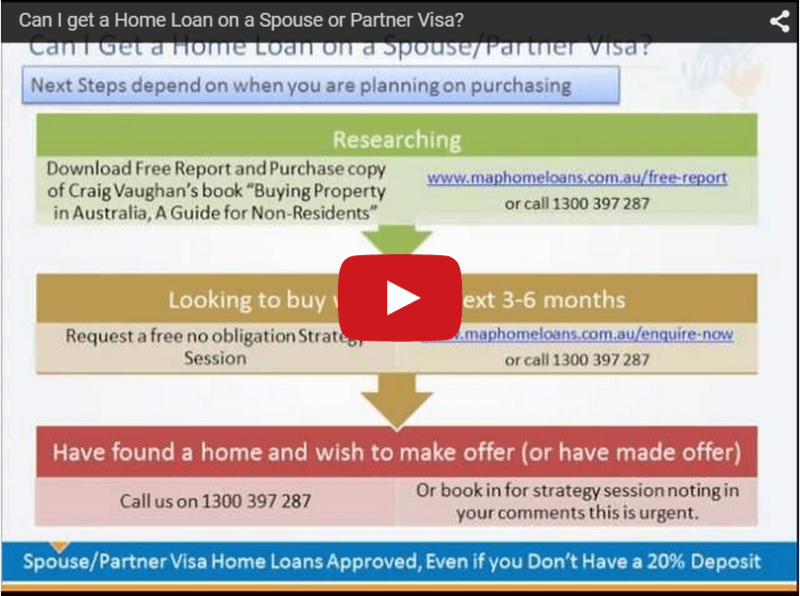 This is a short presentation by Craig Vaughan of MAP Home Loans on arranging a home loan to purchase property in Australia whilst on a spouse/partner visa or as a non resident. 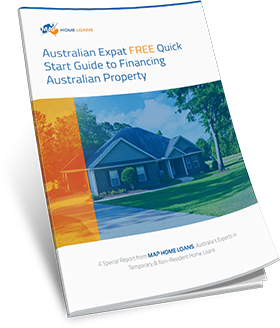 The video covers the deposit requirements and eligibility requirements to arrange mortgage approval as well as briefly covering the steps involved in purchasing a home or investment property in Australia. Case Study: Home Loan Approved on Partner Visa Subclass 820 with only a 5% Deposit! Had been working with another mortgage broker for some time however failed to achieve a result. Kellie and Natius were able to move to Melbourne straight into their own home rather than first renting then purchasing. empathetic and positive nature made our transaction an absolute pleasure! husband and I had almost given up on buying our own property in Australia while he was on an 820 visa. loan and gave great advice. worried our settlement wouldn’t go smoothly. a breeze! I would recommend him with out any doubt! See more of our success stories here.